*I was sent costumes to facilitate a review. All opinions, amazingly gracious husband, and incredibly cheesy way of living life are my own. Engineer began phase 2 of the the Dave Ramsey "Generation Change" materials for our church's youth group on Sunday. He did a great job with the first series and our youth were eager to start the next one. Engineer has been very accommodating when I want to add said flair to his prepared lesson. He's a good man and I love Engineer with every fiber of my being. He said that's his "bacon face"
Why is Engineer dressed as bacon? What does that breakfast turned costume have to do with a financial course for teens? Do you know where the best vacation for couples is? Where did you find those costumes? 1. Engineer dressed as a giant bit of bacon because I asked him to. See, I told you, very accommodating. 3. Everything's better with bacon...even a class on being financially responsible. 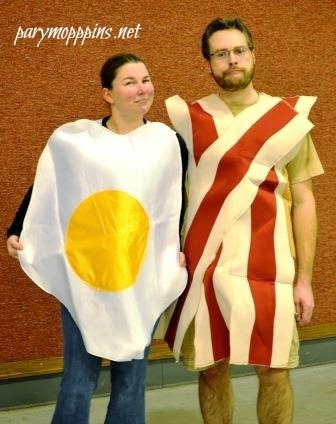 :) The first lesson in this series was on budgeting so to make it memorable, Engineer and I dressed up as bacon & eggs. A visible representation that when you start "bringing home the bacon," you need to make an "egg"cellent budget - or else the "yoke" is on you. I never said my flair was genius, I said it was memorable. 4. I have no idea where the best vacation spot for other couples is, but the best vacation spot for Engineer and me is anywhere with great food, good wine, and each other. 5. 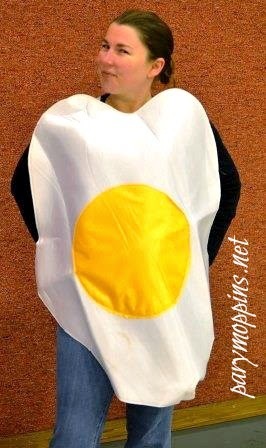 Our costumes came from Costume Discounters but they are also available at Wholesale Halloween Costumes (who in addition sells wholesale party supplies) in case you need a little more bacon and eggs in your life. These costumes were great in that they looked like the photo on the package, they were easy to use, and easy to wear. What else could I need?...Toast...I really want to find a toast costume for Diva so the three of us can go as "Breakfast" for the next Halloween party. P.S. In case you need party supplies all in one fell swoop, this costume company also does a birthday in a box to make it easy to plan a party. Very cute! Everyone should have a bacon face! Thanks so much! We have a lot of fun leading these lessons. Love Dave Ramsey, and love your costumes! Your bit of flair is hilarious and will leave an impression on the teens! 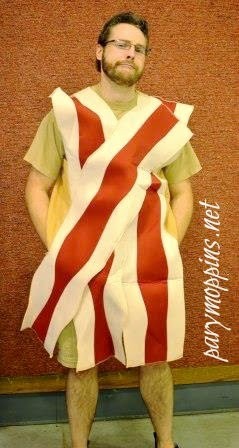 Everyone should have a bacon costume don't you think?